Quality connections for Super Speed performance. Manhattan SuperSpeed USB Cables are designed, engineered and constructed of quality materials to deliver the faster speeds required to support the next generation of the most prevalent computing interface. Backwards compatibility with Hi-Speed USB 2.0 provides a smooth transition between new and existing desktop and notebook computers, digital cameras, PDAs and other popular electronics and mobile computing accessories. Manhattan SuperSpeed USB Cables support data transfer rates up to 5 Gbps or nearly 10 times that of Hi-Speed USB 2.0 on Windows and Mac systems for ultra-fast, reliable transmissions. Full shielding, molded boots and protective, flexible PVC jackets help support SuperSpeed USB bi-directional communications, reduce EMI interference and provide maximum conductivity with minimal user wait times and data loss. 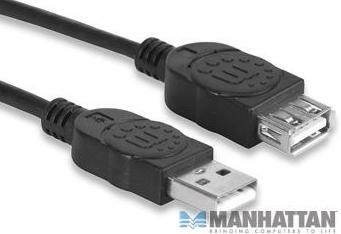 The Manhattan Hi-Speed USB 2.0 Extension Cables easily lengthen connections between computers and USB-powered peripherals. 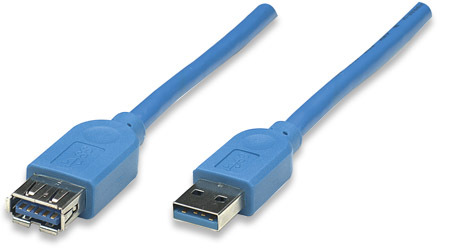 Ideal for use with printers, keyboards, external enclosures and an expanding assortment of digital devices, Manhattan Hi-Speed USB 2.0 Extension Cables are engineered and constructed of quality materials that support data transfer rates up to 480 Mbps to deliver dependable, error-free transmissions over longer distances. Full foil and braided shielding, gold-plated contacts and molded boots with strain relief help assure maximum conductivity for the fast connection of USB-enabled devices with reduced EMI interference and minimal data degradation. The Manhattan Hi-Speed USB 2.0 Extension Cables easily lengthen connections between computers and USB-powered peripherals. 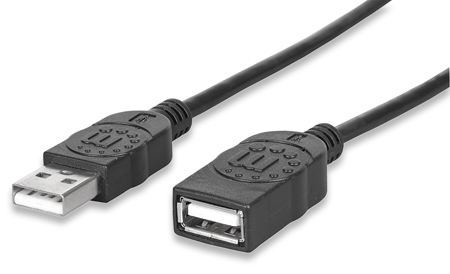 Ideal for use with printers, keyboards, external enclosures and an expanding assortment of digital devices, Manhattan Hi-Speed USB 2.0 Extension Cables are engineered and constructed of quality materials that support data transfer rates up to 480 Mbps to deliver dependable, error-free transmissions over longer distances. Full foil and braided shielding, gold-plated contacts and moulded boots with strain relief help assure maximum conductivity for the fast connection of USB-enabled devices with reduced EMI interference and minimal data degradation. The UniQue USB Printer Extension Cable also known as USB 2.0 Extension Cable Cord Type A Male to A Female is used to extend cable length up to 3-metres. With this handy Cable, you’ll never have to struggle with cables that are too short while connecting your printer, scanner, drive, or adapter. It meets all specifications of USB 2.0 and is backward compatible with USB 1.1 devices. This extension cable supports error-free data transfer rates of up to 480 Mbs and used to connect devices such as digital cameras, digital video cameras, scanners, printers, web cams, mice, keyboards, joysticks, network connections, etc. • Ensures a clean signal transfer, even with large files at high speed. • The connectors are hot pluggable and install with Plug-and-Play ease. 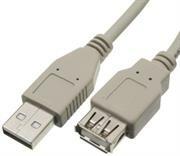 The UniQue USB Printer Extension Cable also known as USB 2.0 Extension Cable Cord Type A Male to A Female is used to extend cable length up to 1.8-metres. With this handy Cable, you’ll never have to struggle with cables that are too short while connecting your printer, scanner, drive, or adapter.